Many people have been immortalized in statue form all over the world, but the latest addition to the Town Square in Sugar Land, Texas, has caused a bit of a stir. The statue doesn’t portray a controversial figure, but shows two people engaged in a very common activity — snapping a selfie. Made from bronze, the statue has two women adopting a slightly crouched pose, and smiling at a smartphone held out in front of them. It’s part of a ten-piece collection currently being displayed around Sugar Land’s public spots, each apparently showing activities that are often seen in the parks. The selfie statue in the Town Square is joined by another of a man playing a guitar. 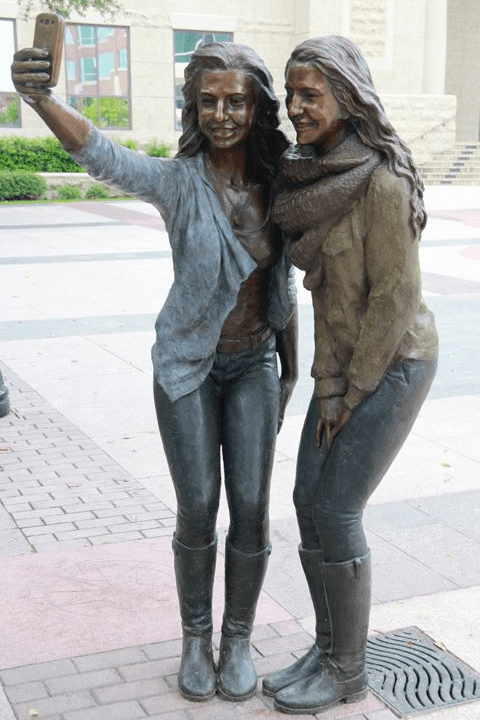 The new statue in sugar land town center of 2 girls taking a selfie makes me really sad. If you’re going to put one, make it meaningful. So is the city of Sugar Land expecting us to take pictures with that statue of 2 girls taking a selfie? I’m embarrassed for everyone. Those complaining about taxpayers money being used on such frivolity will be happy to discover the statues are a donation, but may not agree with the designer’s intention to “enrich the artistic, cultural, educational, and historical character of Sugar Land.” The statues are part of a larger project to find art that “beautifies the city,” and will be officially unveiled at a special ceremony to be held at a later date. Will the Sugar Land selfie statue eventually be seen as a modern age landmark, and will people make a pilgrimage to snap a selfie with it, like a Millennial version of Jim Morrison’s grave in Paris? Only time will tell. Will swarm intelligence predict America's next president?